I unearthed concrete evidence of this while staying with friends on a recent trip to Seattle. One evening my son encountered a "golden age" character for the first time - The Pink Panther. He giggled and grinned his way through the six-minute short as trapdoors conveniently appeared when needed, rainclouds materialized with a snap of the fingers, and sometimes - if they were lucky - characters could walk on air. Dora the Explorer would cringe at some of the decidedly adult sight gags, but kids love them. Over the next five days, my son demanded the Pink Panther no less than seventeen thousand and two times. I buckled on day six and ordered The Pink Panther Classic Cartoon Collection from Amazon. 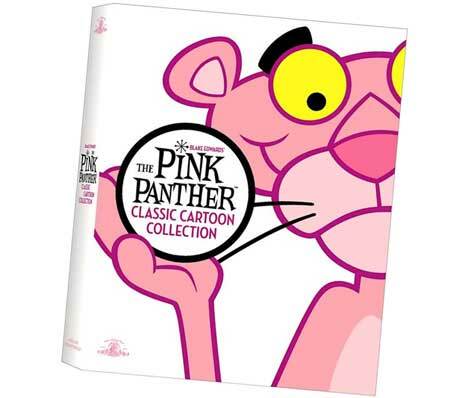 It's a brilliant five DVD set featuring 124 six-minute cartoons spanning the Pink Panther's 1964 to 1980 career. It also includes a mind blowing fourteen hours of the Pink Panther theme, for anyone keeping track. Somehow, Mancini's endless variations provide enough variety to keep even the Grinchiest grownup from grumbling. The digital transfer isn't perfect, but it's definitely nothing to complain about. And it only takes a few seconds to remember that the magic of these shows is the endless stream of sight gags, made all the more impressive by Warner Bros. veteran animator Friz Freleng's impeccable sense of timing. Many cartoon buffs argue that Freleng and Chuck Jones' classic Looney Tunes series from the 1940s and 1950s -- including Bugs Bunny, Porky Pig, Daffy Duck, Sylvester & Tweety, Yosemite Sam and countless others -- were the pinnacle of the theatrical cartoon as an art form. I agree, but the Pink Panther demonstrated that there was still a great deal of mileage left in six minutes of celluloid, even in the mid 1960s. Pink's success was quite accidental. The character was created for the title credits of Peter Sellers' Pink Panther live action feature in 1963. He created a frenzy, and United Artists commissioned a series of Pink cartoons for theatrical release. The DVD collection starts off with the first of these - Pink Phink - which won the Oscar for best animated short in 1964. A Pink Phenomenon was born. But my son doesn't care about all of this. To him, they're just loads of fun. And I've spent more time than I care to admit on the couch beside him, grinning like a kid.